Please stay tuned for pictures on the remodel! 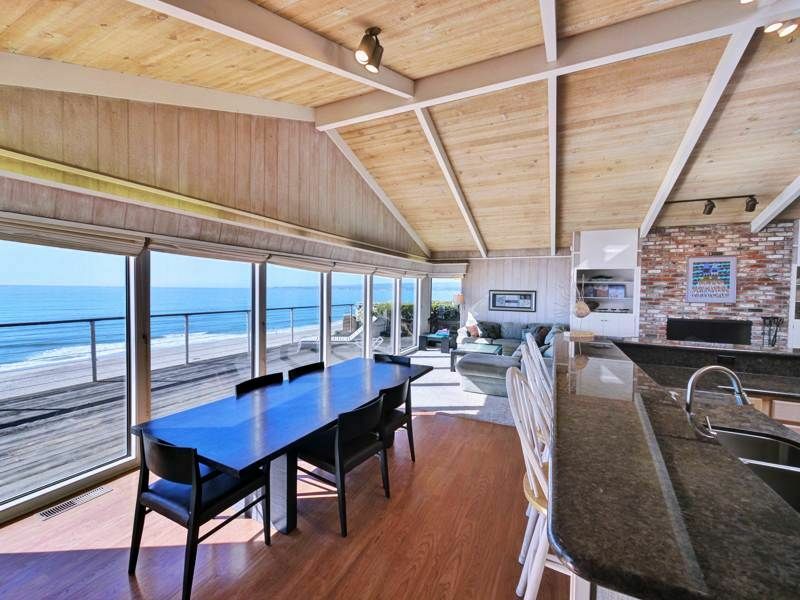 This gorgeous beach front home sits on the bluff overlooking Monterey Bay! Enjoy your vacation on the deck which spans the entire front portion of the house and enjoy the dolphins swim by as you begin your day with a steaming hot coffee. Burn some leisurely calories with a walk on the beach, the stair access is a couple houses down the street. Go big with a hike or low-key with a lunch picnic on the beach for the day. Cook your favorite meals in the fully stocked kitchen or order in or even explore a local restaurant if you don't feel like cooking at all. Finish a perfectly blissful day with your beverage of choice on the deck while watching the surfers squeeze in a last wave as the sunsets before your eyes. Outdoor atrium, beach access 3 doors down, view of Santa Cruz to Monterrey, Wide spacious floor plan with lots of room for large groups, 2 full master bedrooms, front master you can see, smell and hear the ocean, back master bedroom is extremely restful and secluded. The view blew us away and it was a gorgeous weekend! The living, dining and kitchen areas are just fantastic and accommodated the 10 women beautifully. One complaint is that when the cleaning staff come in, they should check the dishes, silverware and glasses. They were all so dirty that we had to wash everything before using. It will be nicer when the bathroom is completed. The bunk/queen sized bed is pretty crowded for 6 adults and should be explained more clearly. We thought that the queen beds were in bedrooms and not attached to a bunk bed. Not all adults want to sleep together in such close quarters and getting to the other bathroom is interesting. They need to get an umbrella for the table on the deck. Overall though we had a fantastic time. This rental worked well for my family of two adult couples, and two children (ages 3 y/o and 7 y/o). The ocean view from the entire back of the house is stunning, and the deck is huge; which is why I chose this house. I spent most of my time on the deck, with a glass of wine, after the first couple of trips down to the beach (108 steps ... great exercise, so they tell me! Didn't slow anyone else down.) and back. The three separate living areas allowed everyone their personal space, and the Duraflame log fire made a very cozy area for reading and chatting in the evenings. The beds were comfortable, and the dining table accommodated everyone, nicely. The kids' room with two single-over-double bunk beds was pretty much wall-to-wall furniture, which you have to squeeze through to access the second bathroom and second king bedroom. The kitchen worked well, and appeared to have been remodeled more recently than the rest of the house. Some of the pots and pans were way past their prime, but there were plentiful nice plates, flatware, cups and glasses. The rental agency was easy to coordinate with, and their office (to pick up and return the key) is only a few minutes away from the house. We'd definitely return. Fabulous family friendly vacation home! After reading the reviews and seeing the pictures of this ocean front house I knew my family just had to stay at this amazing house with a picture perfect view. I have two little ones and we needed a break from the colder weather in Portland. The house, view and beach did not disappoint. I was able to sit on the deck and watch my kids play on the beach. The walk to the beach is literally 1 minute, if that! The house is a perfect layout with a bedroom in the back to put the kids down while we had our own adult time in the front of the house in the evenings. The bathroom is huge with a hot tub which was much appreciated after our long walk to the sunken boat/pier earlier that day. The kids loved seeing the dolphins from the front of the house. The house is very modern and recently remodeled with all the conveniences of home. I definitely recommend this rental and cannot wait to go back! An unbelievable treasure for 1st timers & native Californians alike! This welcoming property sits right on one of the nicest flat-sand beaches in the Western US! There is a wonderful mix of northern CA views & wildlife with southern CA warmth. We stayed at the property in the middle of sumer and experienced very few "tourists" on the beach and the neighbors made us feel welcome. It is only minutes from Santa Cruz and Monterey in either direction, so it gave us countless options for fun, exploring and relaxation each day. The home was clean, nicely decorated, well stocked, and quite comfortable. There was plenty of sitting room throughout the home and in the kitchen for larger parties. There were also extra beds and bathrooms which is always welcome! The cable TV, kitchen amenities, spa, and private interior garden area made us feel like we were in a resort while the ocean, beach, huge window line and sky lights made us feel like we were outside in the wilderness. There was plenty of exploring inside and out that kept the kids busy. The beach was great for boogie boarding, and learning to surf. There were plenty of board games and other activities inside as well as a DVD player for evenings. We could literally watch the kids play on the beach from the balcony. Our favorite experience was sitting on the deck in the mornings and evenings watching the dolphins swimming in the ocean, and watching the baby dolphins learn to jump. We also loved the ocean breeze that came thru the home when the sliding doors were opened. So relaxing! I've lived in California my whole life, have been up and down the Western US coast hundreds of times, and had no idea such a gentle beach with so much room to roam and such amazing views existed in my own backyard. If this place can impress even the locals, everyone else is sure to love it. I have stayed at this beach house repeatedly and never once been disappointed with the accommodations nor the location. Most recently I was here for a girls weekend and we were overwhelmed by the view, the weather, the wildlife and the home. We had everything we needed. There were so many places to gather and visit from the deck to the large open kitchen, to the comfy chairs in front of the fireplace and family room, and of course the beach which is only steps from the home. We loved visiting at the house, the beach, shopping in Capitola and eating at Shadowbrook in Capitola and Palapas at Seascape Village. I've also come with my husband and children, and again we couldn't have asked for a better place to stay. In fact, Aptos is one of our family's favorite vacation spots and when we don't stay at this beach house, we all are a little sad. We have so many wonderful memories here. One of our most favorite parts is seeing the dolphins and seals swim not far from the shore. Also, seeing the locals do fireworks on the beach is always an added and unexpected thrill. Finally, this beach is one of our favorites because the sand is great, and it is rarely crowded. We highly recommend this home, and we can't wait to come visit it again. This house is perched up on the hill to provide wonderful views as far as the eye can see. It had plenty of places for our large group to sleep. We hiked a little and then went wine tasting just minutes from the house. The courtyard was beautifully landscaped. Would definitely come back!